While we're on the subject of travel (read my latest post on airbnb.com here), thought I'd quickly share a photo I'd taken while on the metro in Greece. 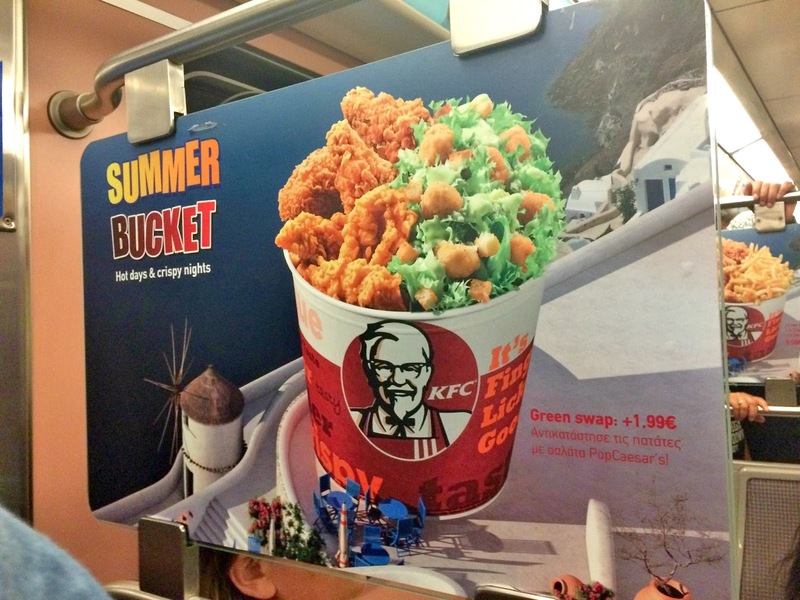 A KFC bucket half filled with a Caesar salad. Isn't that the most cliche Greek thing you've ever seen? Ha! I unfortunately didn't get a chance to try it as my salad hater of a husband wouldn't go near it. 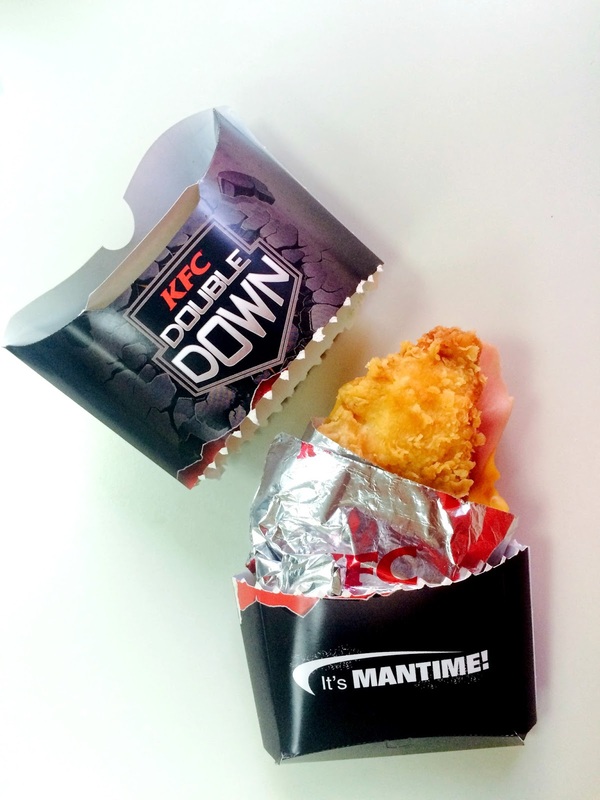 Speaking of which, KFC Kuwait has come out with the manliest sandwich called the Double Down, which is basically two chicken fillets, turkey (because bacon is so good that it's illegal), cheese and the Colonel's special sauce. Its not a new thing though and it has been sold in other countries off and on since 2010. Apparently you need an hour's worth of intense exercise to work off the sandwich and I can feel my arteries clogging up as I write this! An artery clogger that I wouldn't mind trying though is KFC India's Chizza. I've been seeing advertisements for it on the telly for a few good months now and it seems right up my alley. Fried chicken and pizza all in one? What's not to love? Just tried the Double Down and it started off really good, but I only got halfway through it before I'd had enough. The chicken fillets are too thick and the taste gets a little monotonous after a while. There was also a bit too much sauce and to my disappointment, it was just regular mayo. Oh well. Tried it once for the fun of it, but will not be repurchasing. Haha, yeah, loved Greek food. I ate so much meat during that holiday, but really enjoyed every meal. When we were in Mykonos, we had this gorgeous meat stew that had cheese sprinkled through it (could have been feta) and we couldn't get enough of it! We still talk about that stew, it was that good!